If you have to change the amplitude, period, and position of a secant or cosecant graph, your best bet is to graph their reciprocal functions and transform them first. The reciprocal functions, sine and cosine, are easier to graph because they don’t have as many complex parts (no asymptotes, basically). If you can graph the reciprocals first, you can deal with the more complicated pieces of the secant/cosecant graphs last. 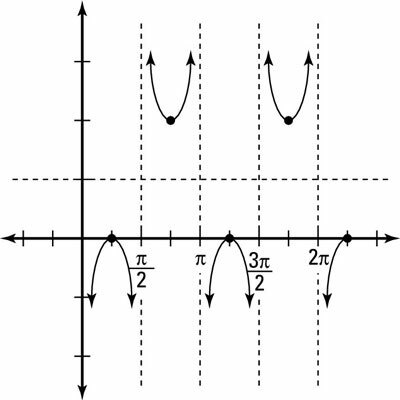 Graph the transformed reciprocal function y = 1/4 cos x – 1. Follow all the rules for the cosine graph in order to end up with a graph that looks like the one in the figure. Sketch the asymptotes of the transformed reciprocal function. 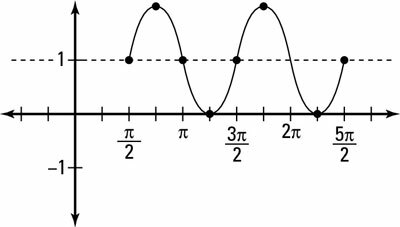 Wherever the transformed graph involving cosine crosses its sinusoidal axis, you have an asymptote in the graph involving secant. 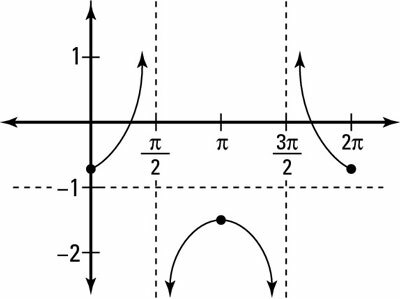 You see that the cosine graph crosses the sinusoidal axis when x = pi/2 and 3pi/2. Find out what the graph looks like between each asymptote. ends up looking like the one in the figure. State the domain and range of the transformed function. Because the new transformed function may have different asymptotes than the parent function for secant and it may be shifted up or down, you may be required to state the new domain and range. You can graph a transformation of the cosecant graph by using the same steps you use when graphing the secant function, only this time you use the sine function to guide you. The shape of the transformed cosecant graph should be very similar to the secant graph, except the asymptotes are in different places. For this reason, be sure you’re graphing with the help of the sine graph (to transform the cosecant graph) and the cosine function (to guide you for the secant graph). Graph the transformed reciprocal function. to the right, and a vertical shift of up 1. 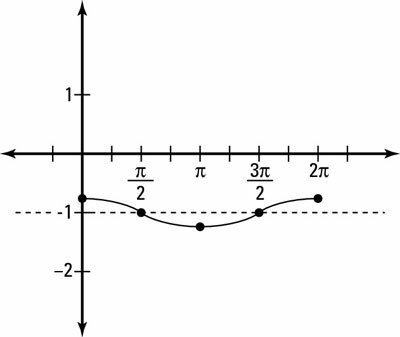 The figure shows the transformed sine graph. Sketch the asymptotes of the reciprocal function. Figure out what happens to the graph between each asymptote. the cosecant is also negative in this interval. The graph alternates between positive and negative in equal intervals forever in both directions. The figure shows the transformed cosecant graph.